Heeft u een vraag voor Khounmee Guesthouse? Goed gelegen in Kong Lor Cave, is het Khounmee Guesthouse het ideale vertrekpunt voor uw excursies in Koun Kham. Vanaf hier kunnen gasten genieten van eenvoudige toegang tot alles wat de levendige stad te bieden heeft. Dankzij de praktische locatie liggen alle belangrijke trekpleisters in de buurt van het hotel. Voor Khounmee Guesthouse is niets teveel om het gasten naar de zin te maken. Zo biedt dit hotel goede service en vele faciliteiten. Het hotel biedt parkeerplaats, rookuimte om gasten een maximaal comfort te garanderen. De ambiance van het Khounmee Guesthouse weerspiegelt zich in de inrichting van de kamers. internet (draadloos), airconditioning, bureau, ventilator, toiletartikelen zijn slechts enkele van de faciliteiten die u ter beschikking staan. Daarnaast garanderen de talrijke recreatieve mogelijkheden dat u zich tijdens uw verblijf kunt vermaken in het hotel. Met een ideale locatie en bijpassende faciliteiten, is het Khounmee Guesthouse voor veel gasten precies wat zij zoeken. Khounmee Guesthouse is in the middle of a small village in one of the most awesome setting in Asia. 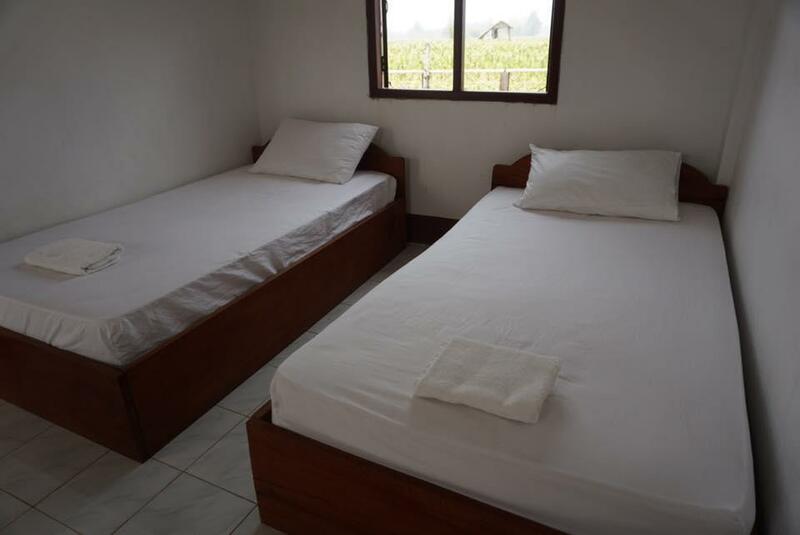 The bamboo rooms are lovely and each opens onto a view of rice and tobacco fields hemmed in by spectacular jagged limestone ranges. The rooms are cleaned every day and each as a small verandah and hammock to simply relax and be. Staff are professional and friendly and speak enough English to handle any questions. The food is good and there are other restaurants nearby. In the evening they light a fire for travellers of The Loop or trippers through the longest caves in Asia to sit and share stories. I stayed two days and came back for a week. Both Guesthouses on same block. Thongdam being bungalo style anf Khounmee the original 6 room guesthouse. The ladies here keep the cleaning to a high standard for a budget facility. We stayed in the older rooms with the only complaint being the lack of water volume for the shower. Check your system if this is a concern to you. We only ate once at the Khounmee Restaurant and thought the fried rice substandard. The newer place 50 metres towards the cave on the opposite side offered much better options. We specifically booked this place with the higher price tag because it advertised having air conditioning and wifi internet. However there is no air conditioning in any of the rooms and when I asked about wifi the owner just walked away from me. The owner insisted we eat at his restaurant across the road and the food was nice but it seemed our presence was a huge inconvenience to the staff/family. There is also construction work going on at the moment so very loud during the day but we understand that not much can be done about that. On the plus side the breakfast in the morning was large with nice coffee. I would recommend updating the listings and working on customer service - a smile goes a long way. Eventhough we paid a room including breakfast they first didn't want to serve us. They sent us away to another guest house. We came back few minutes later and then it was strangely possible to eat. In the internet it's also wriťten that they sell tickets. So we wanted to arrange our trip out of this place and again, they didn't understand what we wanted (the owner was away and all the other people there are not able to speak english) so they sent us again to another guest house. Also the prices for food and drinks are higher than few doors away. We wouldn't recommend going there. We chose this guesthouse because of its proximity to Konglor cave. It's only 1km away so great location. The restaurant was ok, not great choice but decent food. The owner was friendly and was happy to make our breakfast early on our departure day. Très bon rapport qualité prix, bon lit, chambres propres et spacieuses, très bon petit déjeuner, idéalement placée pour aller visiter Konglor Cave à pieds, on recommande !